GOURMET® Gold is known for creating delectable recipes with tender chunks and irresistible gravy. Now your discerning feline companion can enjoy a variety of his favourite foods with a selection of delightful recipes to tempt the taste buds. The selection includes with Beef, with Turkey and Duck, with Salmon and Chicken, and with Chicken and Liver. These four recipes are enough to tempt any cat to their meal, no matter how sophisticated their tastes, with savoury gravy creating an irresistible pull. Each tender, chunky piece doused in a delicious sauce is a taste sensation offfering yoir cat a fabulous and rich flavour. Each meal is also complete and balanced, so your cat will be getting all the nutrients they need from their diet. Our Gourmet Gold Chunks in Gravy multipack contains delicious recipes with Beef, Turkey & Duck, Salmon & Chicken, Chicken & Liver. Complete pet food for adult cats. 100% complete and balanced nutritional pet food for adult cats (aged 1 to 7). Offers your cat the pleasure of a delicate and smooth sensation. Served in 85g cans to keep every meal fresh and convenient. Packed with essential vitamins and minerals to keep your adult cat healthy. No added artificial colourants, flavourings, preservatives. GOURMET Gold has created Chunks in Gravy, delicious recipes to spoil her sophisticated palate with a different taste experience everyday. Tender chunks with Trout and Vegetables gently cooked to perfection and immersed in an appetizing gravy to offer your cat the pleasure of a fabulous and rich flavour. 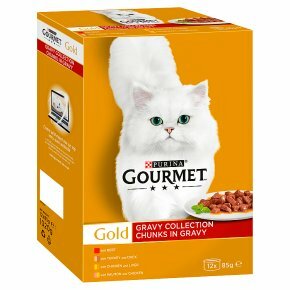 Chunks in Gravy from GOURMET Gold, tempt your cat with a succulent delight!